From Duke of Edinburgh to Week without Walls, Vietnam and Cambodia offer an adventure like no other. Getting outdoors and away from technology provides many benefits for students and teachers alike. Our VST Adventure Tours offers physical challenges, new experiences, breathtakingly beautiful scenery, and an exciting break from daily life. Studies show that students who are exposed to outdoor learning get better grades, have improved health, show lowered stress levels, and have better attitudes about the environment. Adventure tours also help develop global understanding and exposure, and Vietnam and Cambodia are ideal locations for such tours. The unique combination of history, culture, access to adventure sports, and subtropical climate make for a highly desirable travel experience. Outdoor education is one of the best ways to get students off of technology and interacting with their world and with each other. 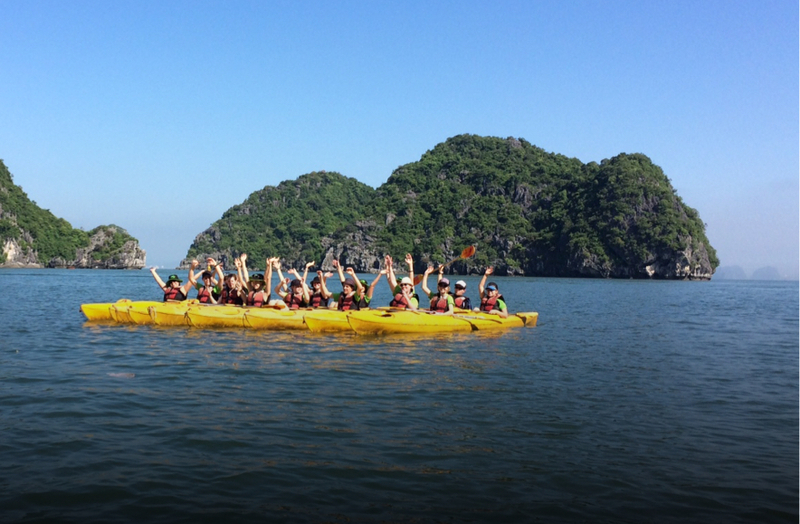 Our Outdoor Education Tours captivate their attention, immerse them in the outdoors, and challenge them while exploring the inspiring subtropical lands of Vietnam and Cambodia. Watch your students gain social awareness, experience personal growth, and develop skills for life and the world of work. We depart today for our flight to Siem Reap. Upon arrival we transfer to our hotel after meeting our guide at the airport. This morning we set off on our cycling expedition, visiting Angkor Archeological park. Once there we will explore Angkor Wat, Angkor Thom and Ta Promh which was made famous by the Hollywood blockbuster Tomb Raider. In the afternoon will continue the cycling adventure through Preah Dak village and the lush green countryside of Siem Reap as we make our way to the village of Tbeng. Upon arrival we will unpack, settle into our traditional longhouse accommodation and will get ready for the tastiest ‘pit fired’ chicken, taro and other wonderful local dishes. This amazing dinner will be enjoyed while watching and listening to some very talented local entertainers. After breakfast we cycle East of the village to visit the hidden ruins of Beng Mealea. Once there we will find a truly spectacular temple consumed by the forest and enclosed by a massive moat measuring 1.2 km by 900 m. After exploring the temple we will stop for lunch and then spend the afternoon helping to plant fruit trees - a key element in assisting the village’s sustainability for years to come. To conclude the day we will embark on an awesome Eco Tour where we will farm, fish, plant crops and ride a buffalo, giving us a true sense of the rural Khmer lifestyle, before returning to Camps Tbeng. Today we combine our energy and enthusiasm and begin our service work. After a short cycle we will spend our time working towards the betterment of the lives of those who are less fortunate. This morning we check out of Camps Tbeng and head south towards Bakong, cycling through the local villages and learning how to make traditional Khmer noodles. After a leisurely lunch on the banks of the Siem Reap river we enjoy an ox-cart ride through Bakong, before taking a boat ride to the floating village of Kompong Phhluk which is built on stilts. Tonight we spend the evening in a homestay accommodation experiencing life in the floating community. After breakfast we say goodbye to our homestay hosts and cycle back to Angkor Archaeological Park to spend the mid-morning at Angkor Zipline. With 4 ziplines, 3 bridges and an abseil to conclude the course, it is not only a truly unique, adrenaline packed experience, but is the best view in Siem Reap. After having lunch we check into our hotel and then head to Phare Cambodia workshop to participate in a circus master class. Phare was started by an art teacher in the village of Battambang to help socially deprived and troubled youngsters after the Khmer Rouge regime. The association now offers free education along with art, music and circus school. Dinner tonight will be at the FCC Angkor which sits at the heart of Siem Reap Town. Overlooking the Siem Reap River this renovated French Governor's mansion is the perfect place to recap our first week and look forward to our travel to the adventure capital of Vietnam, Dalat. Tonight we make our way to Phare Circus to enjoy an amazing acrobatic performance. This morning we will have the opportunity to try our hands at the traditional martial arts of Bokator. Oral tradition indicates that Bokator was the close quarter combat system used by the armies of Angkor 1000 years ago. Later this afternoon we transfer to the airport for our flight home. 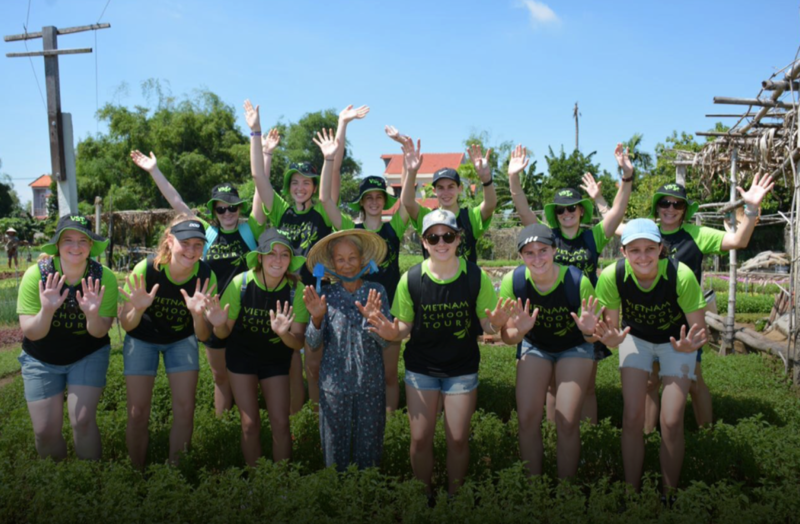 Our Week without Walls tour provides students with a week where they can expand their horizons while immersing themselves in the cultures and traditions of Vietnam and Cambodia. We expose students to the values of responsibility, perseverance, passion, and creativity, and give them opportunities to see how these values apply to their own lives. Students are encouraged to become “caring global citizens” through community service, appreciation of other cultures, and working together as a team. 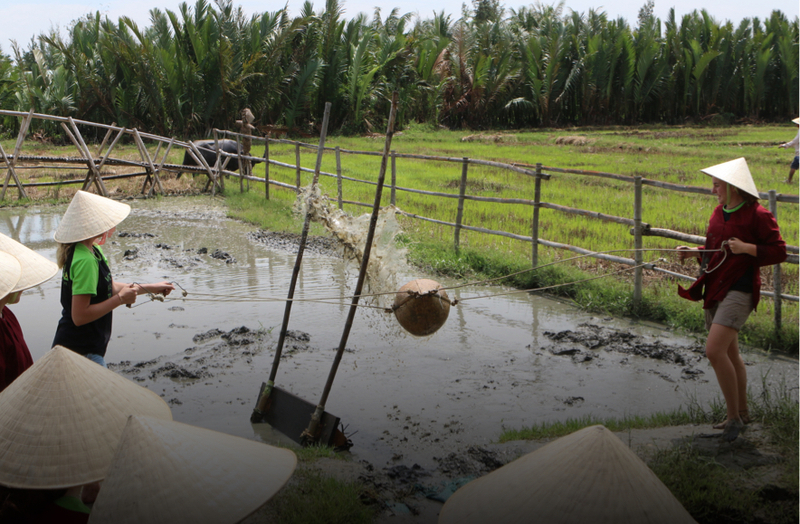 Upon arrival in Saigon we will be met by our friendly guides and transferred to the hotel. After breakfast we make our way to the Reunification Palace and the War Remnants Museum where we will see countless artifacts, photographs and pictures documenting the tragic Vietnam War. This afternoon we will visit Thien Phuoc orphanage, which houses approximately 65 children all of whom have a disability. Some of the children are orphans while others could not be cared for by family members due to lack of finance and facilities at home. The children are cared for by a group of nuns who have dedicated their lives to these children. We will volunteer and help out at the centre. Dinner tonight will be at K.O.T.O restaurant. K.O.T.O, is a non-profit organisation which is run by local children who have been recruited from the streets. This morning we partake in a Race Around Saigon. We will make our way around the city visiting sites such as the Notre Dame Cathedral, the Old Post Office and Ben Thanh Markets. By following clues, chatting to the locals and fulfilling activities (e.g. keeping a shuttlecock off the ground as it gets passed around the group – a favourite Vietnamese sport) we will visit all the main sites whilst learning about them in a fun and educational way. The last clue will lead to a restaurant where we sit down to congratulate the winning team and enjoy lunch. Later this afternoon we make our way to a local primary school for disadvantaged children. We will spend the afternoon helping out with the lessons whether it be in art or in English. It will be a great experience for both the local students and for our group. After breakfast, we make our way back to the school to continue helping out with lessons. Later this afternoon we make our way to a cooking class. Our class will start at the wet market with our chef walking us through the markets and explaining all the different types of foods and vegetables and all the ways of cooking them. Following our guided tour we head back and begin to cook. We will then finish off our cooking class by sitting down and enjoying what we have just prepared. Later this morning we make our way to the Cu Chi tunnel system; a complex maze once home to Communist guerrillas in their wars against the Japanese, French, Americans (and Australians). Before entering the tunnels, we will watch a short introductory video and then explore Cu Chi. Also on display are various mantraps, the remains of an American tank as well as numerous bomb craters created by 500lb bombs dropped by B52 bombers. We have an early start this morning as we make our way to the airport for our flight to Dalat. After breakfast today we set off south of Dalat to begin our trekking adventure. The 9 km trail takes us along a jungle fringed ridgeline, charging up to its peak elevation and then gently rolling onwards as we head back down to the lake to complete our journey. We will have the opportunity to navigate along the way using topographical maps and compasses. After a short boat ride to Nam Qua Campsite we enjoy the best of the local Dalat produce with a well deserved lunch. In the afternoon we are divided up into teams to take on a raft building challenge. Using bamboo, twine, floating drums, problem solving skills and teamwork, together teams must design and build rafts which we will use to race each other around a set course on Tuyen Lam Lake. Tonight after dinner we settle in around the campfire for some traditional local entertainment and marshmallow toasting. Overnight: Tuyen Lam campsite in tents. This morning we board our boat for a picturesque ride along Tuyen Lam lake as we head to for the high ropes course at Golden Valley. Once there we take on the challenge of the Monkey Bridge, the Leap of Faith and the Zip Line across Golden Valley Lake. After lunch we set off on an adrenaline packed afternoon of abseiling on Langbian Mountain. Following a ride up the mountain we walk to the training site for a safety briefing, gear overview and a practice abseil. We then traverse to the cliff face for not only some of the most spectacular views in Dalat, but more importantly to take on the 25m wall perched at the top of one of the Langbian mountain peaks. This evening we enjoy a bbq buffet dinner. After breakfast we head to Datanla waterfall to ride the toboggan cart to the valley floor to explore the falls. Following this we enjoy a cable car ride to Truc Lam Zen Monastery, taking in great views of Dalat city and a quiet moment to reflect. This afternoon we stop by Dalat Market for some souvenir shopping before making our way to the airport for our short flight to Saigon. In the morning we will check out of the hotel, go to the airport and board our plane for our flight home. The Duke of Edinburgh Tour in Vietnam or Cambodia provides an excellent opportunity for students aged 14 and older to experience another culture while working towards their awards. They’ll be challenged mentally and physically in the rough and extraordinary terrain and landscape while broadening their horizons, gaining skills, and developing friendships. Experience historically significant countryside while on our Duke of Edinburgh Tour! We depart today for our flight to Dalat. Dalat city is one of the true hidden gems of Southeast Asia. This mist enshrouded city on the highlands is surrounded by lakes, pine forests and spectacular mountains and the spring-like weather it makes it the ideal adventure capital of Vietnam. Upon arrival we transfer to our hotel after meeting our guide at the airport. This morning we will have the opportunity to purchase food for the following two days trek through the Dalat countryside. Following this we meet our trekking guides for an orientation of map reading, compass use and orienteering review and instructions. We then embark on our journey, walking through forest & coffee plantations, alongside rivers & crossing suspension bridges. After lunch we make our way to the remote minority village of Chil and then head to our campsite to set up for the night. After breakfast we pack up our campsite and begin our second day of trekking. This morning we head along the forest paths that lead to the beautiful flower valley of Thai Phien Flower Hamlet. After lunch we continue our trek, taking in the stunning scenery and surrounding mountains. We then make our way to the rendezvous point to meet our transfer back to the hotel. We spend the evening enjoying dinner and a well deserved rest after a great two days of hiking. This morning after breakfast we step back in time and take the train to Trai Mat Village. After lunch we visit Crazy House and then head to the Big C shopping centre to purchase supplies for the next two days when we will complete our qualifying Adventurous Journey. This morning after breakfast we again meet our trekking guides and embark on our trek towards Dankia Lake. Our journey takes us through the picturesque countryside of Dalat as we trek through the North through pine forest towards Cong Troi (Heaven Gate). The 12 km trek will be undulating, starting at 1,500 meters of elevation, peaking at 1,755 meters. That evening we will set up camp by a small stream, cook dinner and take in the beauty of our surrounds whilst sitting around a campfire. After packing up our campsite, the group will go down through some water crossings and coffee farms heading to the base of Langbian Mountain. We then hike through pine forest to one of the three peaks of Langbian Mt at 1,988 meters above sea level. The last part is about 1.5 hour trek down to the car park where our vehicle will pick up the group and transfer back to our hotel for a well deserved rest. This morning we will visit vegetable, flower and coffee farms along with a silk factory and rice wine distillery. Stopping by the Elephant waterfall and the giant statues in Linh An Pagoda we then head to Datanla waterfall to ride the toboggan cart to the valley floor to explore the falls. We finish our city tour with a cable car ride to Truc Lam Zen Monastery, taking in great views of Dalat city and a quiet moment to reflect after a busy day of sightseeing. Tonight we celebrate our time in Dalat with a farewell bbq buffet dinner at Dalat House restaurant. Today we will spend some time at a local school for our community service project. Here we will be provided with a rewarding and fun opportunity to help out with the daily routine of the students. Whether it be helping with English lessons or involving ourselves in leading some fun games or creative activities the day will be a great experience for the local students and our group alike. Dinner tonight will be at K.O.T.O restaurant. K.O.T.O, founded by Vietnamese Australian Jimmy Pham (an ‘old boy’ of De La Salle Ashfield), is a non-profit organisation which is run by local children who Jimmy recruited from the streets. Today we begin our sightseeing around Vietnam’s largest and busiest city - but we do it "Amazing Race" style. Teams will each be given a guide and will need to join forces in a team challenge of map reading, negotiating and interacting with locals and displaying creative communication skills. After lunch we transfer to the airport for our flight home.